Robert Garland is the Roy D. and Margaret B. Wooster Professor of the Classics at Colgate University. He is the author of Wandering Greeks: The Ancient Greek Diaspora from the Age of Homer to the Death of Alexander the Great and The Eye of the Beholder: Deformity and Disability in the Graeco-Roman World. Ancient history has a solution for the political pickle President Donald Trump has found himself in during his ardent quest for a wall across the border between the U.S. and Mexico. 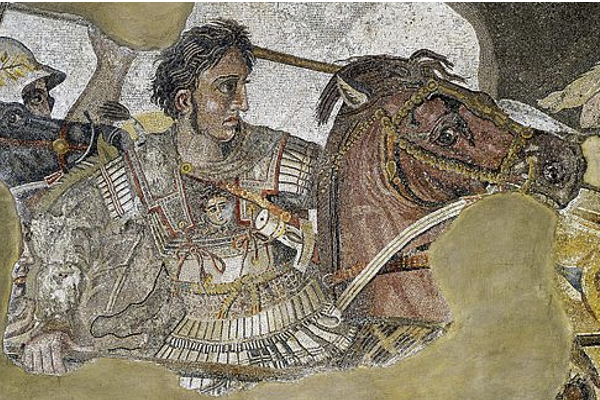 Alexander the Great of Macedon was in a similar political standoff roughly 2,300 years ago. After Alexander conquered the Persian Empire, a sprawling land mass of about one million square miles which constituted the largest empire the world had ever seen, he still wasn’t satisfied. Far from it. He wanted to reach the end of the world, so he continued through modern-day Pakistan until he reached a river called the Beas, a tributary of the Indus in the Indian state of Punjab. It was at this tributary where Alexander’s men finally dug their heels in and refused to go on. They’d marched over 2,000 miles – incidentally approximately the size of the Mexican border – having set out from Macedon eight years previously in 334 BCE. So, what did he do? Well, at first Alexander threw a really big temper tantrum and sulked in his tent for several days. But his men refused to yield. In the end, there was nothing to be done except give in – the first time in recorded history Alexander had ever given in. As a face-saving gesture, he decided to erect 12 really big altars, altars the size of which no-one had ever seen, beautiful big altars, on the bank of the river to celebrate the magnificence of his enterprise and to stun generations to come. His men praised him for wisdom, then he and his army started the long trek home. If President Trump would have the humility to compare himself to Alexander the Great he might be able to find a way out of the predicament of his own making. And nobody I suspect would object if he erected a few altars to the great god MAGA on this side of the Mexican border in lieu of his current quest for a grand barrier. Perhaps the Democrats might even be persuaded to fund them. They’d certainly cost less than a wall.